This is an electronic, synthesized performance of assorted music from the Middle East. Some are folk songs, while others are classical Egyptian pieces. Several of the songs come from Iraq and Syria, so they capture the Arabic flavor while providing an appealing change-of-pace sound. Most of the songs are shorter than 4 minutes, so they could be suitable choices for up-and-coming beginners or intermediates as well as more experienced dancers to use in performances. This music offers an enjoyable introduction to a side of Arabic music that many Oriental dance artists have not been exposed to: folk songs from Iraq and Syria. It also includes a drum solo and some selections in the classical Egyptian style, including the Oum Kalthoum song "Alf Leyla Wa Leyla". The songs are played using electronic instruments, providing an up-to-date flavor for this traditional music. Some of the songs are instrumentals, while others are vocals. For most of the songs, the style is energetic and upbeat. There is one slow, improvised piece. It's a little quirky that the same finale music appears on it five times, but that doesn't really bother me. 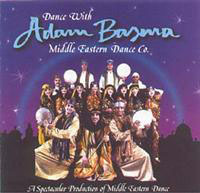 Dance with Adam Basma 3:22 No Not applicable Varied speed rhythms. Strong flavor of Egyptian-style show. Best for experienced dancers. Finale 0:21 No Not applicable Echoes a piece of the melody from the first song. Drum Solo 2:56 No Not applicable Several call & answer sections. Finale 0:21 No Not applicable Same as Track 2. Talamin Bet Abouha 3:37 Iraq Yes No 6/8 rhythm. Lively, fun. One of my favorites on this album. Joelle 1:53 No Not applicable Slow ayyoub with improvised melody line. Maryamtane 4:15 Syria No No Folkloric melody. Vocals. Lama Rah Alsaber 3:38 No No Orchestral style. Ana Elmsakenah 4:34 Iraq Yes No 6/8 rhythm. Lots of fun. Maybe good for audience participation. Ben Alasser 3:41 Iraq No No Female vocal. Alf Leilah 4:17 Egypt Yes No Alf Leyla wa Leyla - a classical Egyptian song. You like Middle Eastern music, but prefer traditional songs over 20th-century compositions. You're looking for change-of-pace Arabic music that stays true to the Middle Eastern style but offers songs that aren't widely used by dancers. You like to use music with an electronic, synthesized sound. You prefer traditional instruments instead of electronic, synthesized sound. I appreciate the use of Iraqi and Syrian music, which offers inspiration for dancers looking for fresh material. The spirited, upbeat tone is enjoyable both for listening and for dancing. Some of the songs are simple, while others are more complex. This makes some of the music suitable for newer performers, while providing other selections that allow experienced dancers to demonstrate their ability to work with more complex music. The recording makes effective use of stereo effects. Music travels from one speaker to the other. The liner notes identify the country of origin for the folk songs. Except for Joelle, the songs are mostly high-energy and upbeat. It might have been nice to have a couple of ballads for contrast. Aside from identifying the country of origin, the liner notes don't offer any further insight into the music. For example, they don't comment on what the lyrics are about. This is a joyful, upbeat collection of songs suitable for Oriental styles of performances. These recordings should work well when dancing for younger crowds likely to appreciate the electronic sound. I have never met Adam Basma, although we have occasionally corresponded over e-mail. He sent me a complimentary copy of this music to review for my web site. 1551 S. La Cienega Blvd.